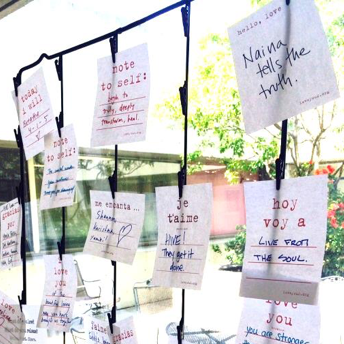 Love Notes on display at Beyond Compassion. On a warm, sunny day in May 2016, 50 HIVE stakeholders – some decades-long colleagues, others new acquaintances – from agencies across San Francisco gathered at Zuckerberg San Francisco General Hospital and Trauma Center (ZSFG) with the intention of learning more about how intimate partner violence (IPV) and trauma impact the lives of women. Attendees represented ZSFG Obstetrics, Gynecology & Reproductive Sciences; Ward 86 Positive Health Program; Hospital Administration; Sojourn Chaplaincy; UCSF; San Francisco Department of Public Health; and community-based organizations serving women. HIVE brought this group together in an intimate format to further develop the system of trauma-responsive care provided to HIVE clients across the healthcare continuum, and over the course of their lives. Twelve locally and nationally esteemed speakers shared expertise from their respective fields, presenting on topics including: trauma-informed care for women; disclosure, criminalization and stigma for women living with HIV; reducing anxiety and pain during gynecological exams; and healing rituals and practices for service providers. Click here for the symposium agenda and speaker bios. After each session, Silvi Alcivar, owner and poet of the Poetry Store, shared a poem which she wrote in the moment to synthesize the presentation. Her words stirred emotions buried within, touching the heart and the soul. Sessions unearthed deep feelings, challenged underlying implicit biases, filled knowledge gaps, and inspired more trauma-responsive, resiliency-based, compassionate care. To conclude the day, Linda Scruggs, a national leader and advocate in the field of HIV led the group in a commitment to change exercise. Ms. Scruggs harnessed the swirling ball of kinetic energy in the room into steady streams of forward-propelling action. “Silvi felt like the emotional glue to our day”. Silvi Alcivar, owner and poet of the Poetry Store, recited a poem following each presentation as well as a poem summarizing the entire day. Click here to read all poems from the day. what’s the beauty of what we attract? what’s the beauty asking me to heal? the wise one remembers the breath. the wise one drinks the waters of nourishment and release. there’s always a source of light. what are you teaching me? what isn’t being seen, held? in ourselves and our inheritance. call in your support. breathe. put on your golden cape. Becoming a trauma-responsive, resiliency-based organization cannot be accomplished in a day. Our hope is that by recording each of the Beyond Compassion sessions, you will view, learn, and pass it on. Below are links to each of the recorded sessions. We share these videos with the intention that our learnings can be disseminated far and wide to improve the lives of all women. Check out our Huffington Post piece on resiliency and healing. Tag #BeyondCompassion when you share online. I am a human trafficking survivor, familial human trafficking, I have extensive complex trauma and through years of working on my trauma have had difficulty in finding resources. I try to give back by being a speaker as well as a peer support specialist in mental health. I’m currently doing the above and doing an apprenticeship in herbology as well as training a service dog. I continually run into challenges of getting adequate health care. If you can help or offer resources please contact me.